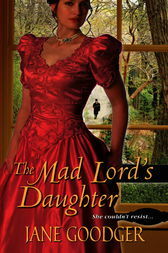 Locked away by her reclusive and intensely protective father, the recently deceased "Mad Lord of Northumberland," Melissa is beautiful and educated but painfully naïve about the real world--and the dark secrets of her birth. Now in the care of her uncle, the Earl of Braddock, she must prepare to enter London society and find a proper husband, a task that grows complicated when she falls for the one man she can never have. Just as a promising new life begins to eclipse her tragic past, she'll find herself consumed by a forbidden love that could destroy it all. . .